SUPPLIED PHOTO BY NU-SUN CINEMA Nu-Sun Cinema use recycled Christmas trees to help eliminate light from the city of Winnipeg. Do what you love, and do it well. Those are words that Rick Onskie takes to heart. "I always had a thing for nature," Onskie said. "From when I was knee high to a grasshopper, my parents and I spent a lot of time in nature, out in the bush." Fifteen years ago Onskie, who is now retired from a lifetime of work in construction, picked up a camera and started documenting the natural world he and his wife, Kim Bisson, were so fond of. Nu-Sun Cinema maintains a high definition livestream of a nesting American kestrel falcon family each spring and summer for the American Kestrel Partnership. "We both love nature, period," Onskie said. "So I started doing this casually, more with photos. I did sell prints in stores, but I got away from that. I took more interest in capturing video." The result is Nu-Sun Cinema, a non-profit wildlife-based production company. "This is more than a hobby," Onskie said. "This is a passion. I do it because I love it, not because I have to." "I got thinking about all the wonderful animals that come through here," he said, referring to his back acre. "I’ve had bucks duelling here, during the rut. The stuff I’am getting just right here, it€’s amazing! I position cameras in different places, different angles. I learn as I go." 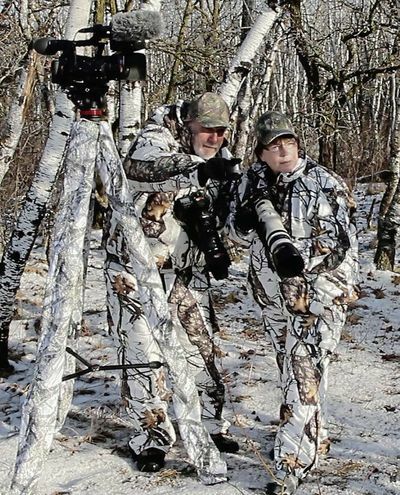 Rick Onskie (left) and his wife Kim Bisson are outdoor enthusiasts who have channeled their love of nature into Nu-Sun Cinema, a non-profit wildlife based production company..
"I got thinking about all the wonderful animals that come through here," he said, referring to his back acre. "Iâ€ve had bucks duelling here, during the rut. The stuff Iâ€m getting just right here, itâ€s amazing! I position cameras in different places, different angles. I learn as I go." To cut down on light pollution from the city, Onskie began repurposing old Christmas trees as a backdrop for his videos following the holiday season. With 1800 watts of remote lighting, Nu-Sun Cinema has captured and released plenty of footage of deer, foxes, and coyotes in their natural habitat. The videos are posted for free online. "After a while, I learned how to beat the glass to set up my cameras in here," he said. "Itâ€s all about learning how to use your equipment, and your limitations." 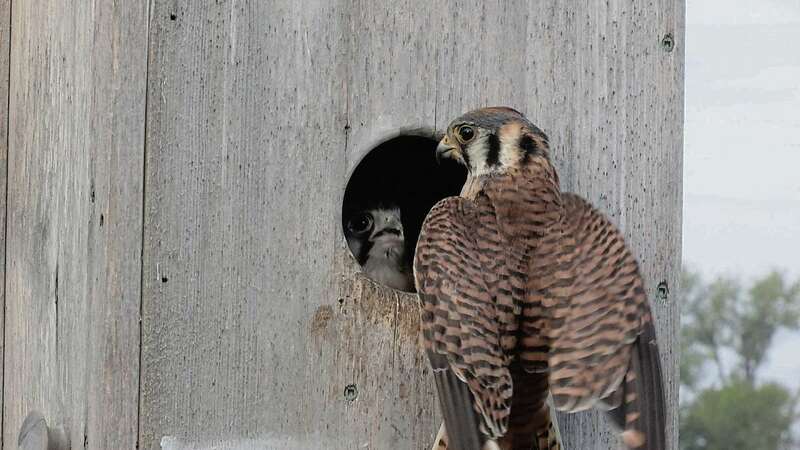 Each spring, Nu-Sun Cinema also hosts a high definition live stream of a family of nesting American kestrel falcons for American Kestrel Partnership and Boise State University in Idaho. "What I’m all about is learning, and sharing," Onskie said. Onskie added that he has no fear of getting up close and personal with his subjects. "I have no fear of animals of any kind, but I have a great deal of respect," he said. "I learn about what I’m filming, to learn how those animals react. "If they give me signals to back off, I leave," he added. "But you know what? I’d rather have some animal rip the living daylights out of me. That would be a good death for me. It’s better than me going out on the street somewhere and having some idiot drive into and kill me." Visit www.nu-sun.com for more information and to view Nu-Sun Cinema’s video library. Thank you very much Sheldon Birnie ( coummunity journalist The Herald news paper ) for the great article.